Crossville (population 782) is located in southeastern Illinois on Il. Route 1 six miles south of Interstate Highway 64. This places Crossville in northeastern White County about seven miles west of the Indiana State line. Carmi is located seven miles southwest of Crossville. Elliot Creek trickles through the southwest side of town and the Consolidated Rail Corporation Railroad laid some tracks through town as well. "My father graduated from Crossville High School in 1924. He went his freshman year to Carmi. 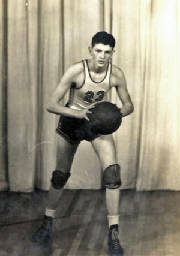 He started his sophomore year in Crossville in the 1921-22 school year and graduated in 1924. His name was Charles R. Long." It was in the mid-1980s that consolidation talks became serious between Crossville and Carmi. In 1988 Crossville High School was closed and Carmi-White County High School was born. Crossville High School is no longer used as a school, but it is still standing. There is still a grade school in Crossville for the White County School District. School Fight Song: "Crossville High, We're Loyal to You"
Crossville High we're loyal to you, long may our colors fly! We'll fight to the end; determined to win, for dear old Crossville High. Beat 'em, defeat 'em and fight e'm for our fame! Play fair and shoot square and we will win this game! Both boys and girls faired well at Crossville High School. IHSA hardware was won in boys basketball, girls softball, boys track, and some nice records were made in girls volleyball. We are need of some interesting items regarding Crossville such as the school nickname, colors, and fight song. We are also in need of information on the better teams not found on the IHSA web site (www.ihsa.org). Please drop us a note at eganann@sbcglobal.net if you would like to share your knowledge of Crossville athletics with other readers of this site. Two Regionals and some incredible success defined the softball program in Crossville during the mid 1980s. Coach Larry Gariepy led the girls softball team from 1981-82 through the 1986-87 season. During his 6 seasons the Crossville girls accumulated a record of 105 - 15! One Crossville fan tells us that Penny Harrington (Martin) hit 2 grand slam homeruns in the same inning against Carmi during our 1983-84 season. Penny was subsequently featured in the “Faces in the Crowd” section of Sports Illustrated! We are also told that Amy Swingle hoolds many Crossville softball records including having struck out only FOUR times in her career which started her freshman year. The strike outs included two her freshman year and two her sophomore year! If you have any other personal knowledge of these or other Crossville softball seasons write to us at eganann@sbcglobal.net. The boys basketball team brought home three District titles (back to back to back) and one Regional title. Unfortunately, in most cases, the team records and coach's names are not available. We are hopeful a Crossville HS fanatic will help us here. In a February 16, 1985 game against Evansville, IN Christian, Crossville player Andy Scarlett made 21 free-throws, the most in school history. He attempted 26 in this game. Andy finshed the game with 61 points! The lady ahtletes from Crossville had some success in volleyball too during the 1980s. Their best two teams listed on the IHSA web site are listed below. One male athlete, Glen Piland, won a medal in an event at the state track meet. 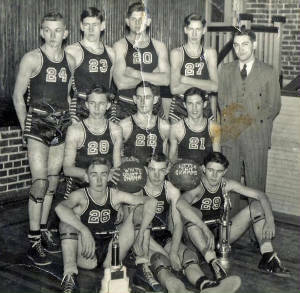 **Don Prince (Class of 1944): Upon graduating from Crossville High School Don continued his basketball career at Illinois State University, eventually being named captain of the team. Don went on to a career in education and at one time held the position of Chairman of the Illinois Board of Higher Education. 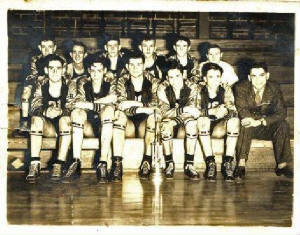 "My father, Julius Yelch, attended Crossville HS beginning in 1938 and graduating in 1940. I have viewed his track ribbons won at White County Track Meet in 1940. He also claimed to be the only male cheerleader in the history of Crossville High."